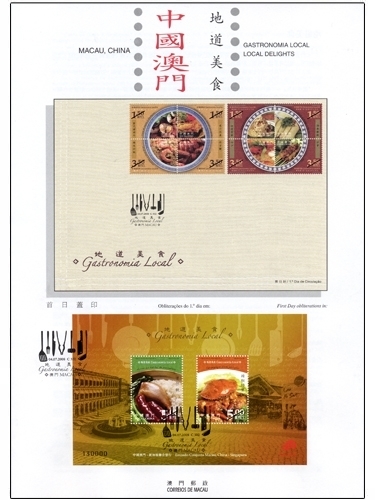 The first joint issue between Macao Post and Singapore Post with the stamp theme “Local Delights” will be released on 4th July, 2008, this set of stamps will also be available at the Singapore Post booth during the Singapore Food Festival. 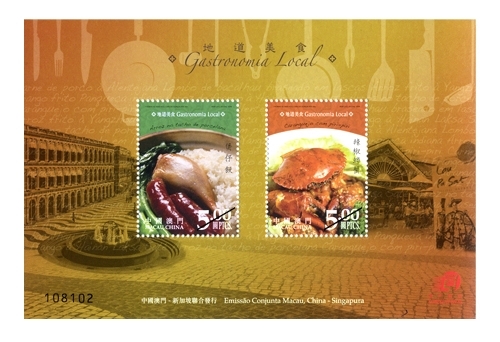 With a set of 8 stamps which illustrate the local food of Macao: “Yangzhou fried rice”, “Crispy fried chicken”, “Carne de porco à Alentejana”, “Lombo de bacalhau braseado em lascas” and the local food of Singapore: “Hainanese chicken rice”, “Laksa” and “Roti Prata” and “Satay”. 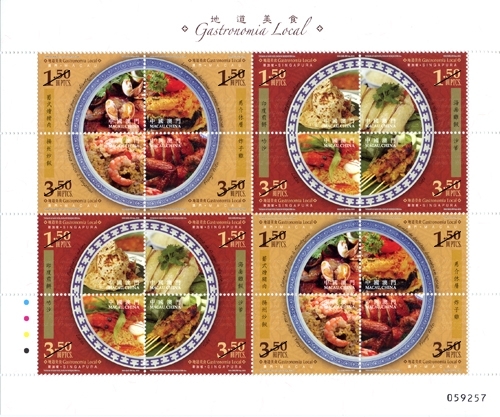 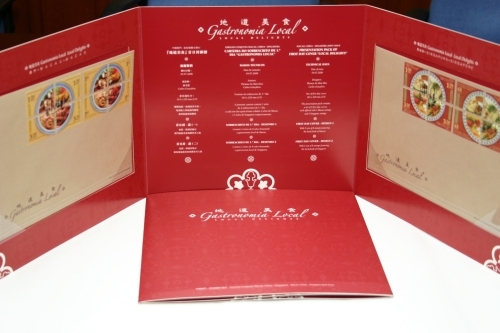 The souvenir sheet is featuring the “Clay pot rice” from Macao and “Chilli crab” from Singapore. 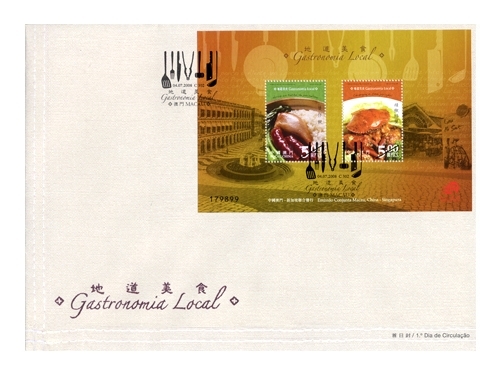 Contains 2 sets of 8 stamps featuring the local foods of Macao, with 2 stamps at MOP1.50 each, 2 stamps at MOP3.50 each and 4 stamps at SGD0.26 each. 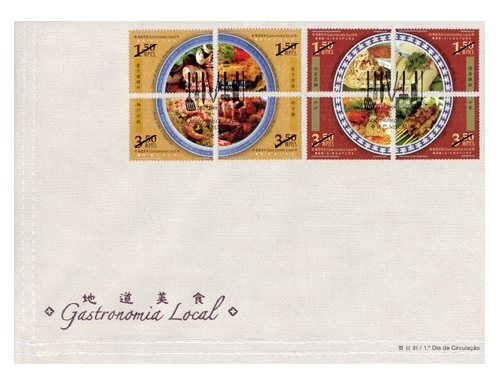 First Day Cover – Design 2: Contains 2 sets of 8 stamps featuring the local foods of Singapore, with 2 stamps at MOP1.50 each, 2 stamps at MOP3.50 each and 4 stamps at SGD0.65 each. 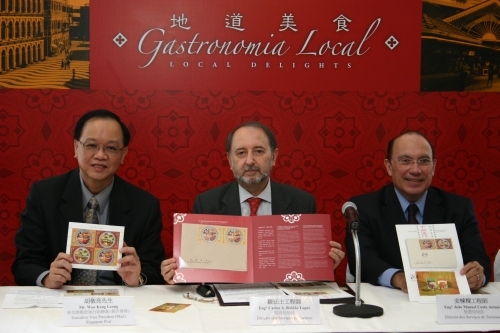 The stamp designers for this issue are Mr. Thomas Au Man Hou and Mr. Carlos Gonçalves, and the text for the information brochure is written by the Singapore Post, Mr. Manuel António Geraldes of Macau Military Club and Mr. Lok Pó. 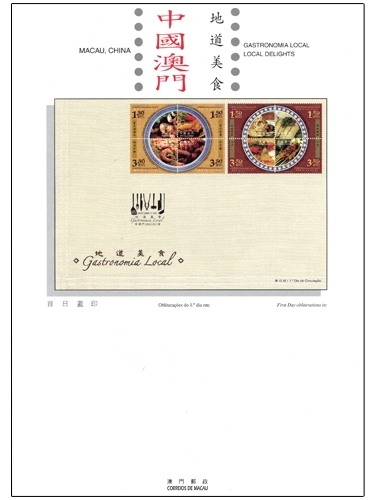 This is the fifth issue in 2008. 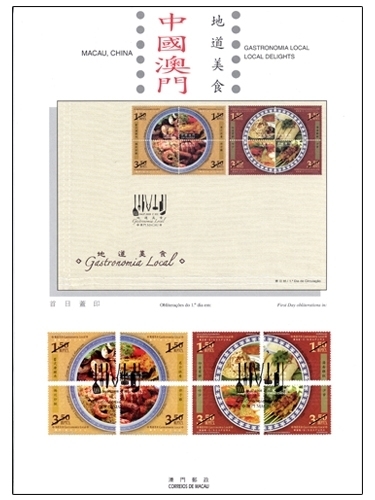 The issued stamps are as “Lunar Year of the Rat” on 23/01/2008; “I Ching, Pa Kua VI” on 01/03/2008; “Beijing 2008 Olympic Torch Relay” on 03/05/2008 and “Legends and Myths VIII” on 02/06/2008.